Oh, god Guys I am ABSOLUTELY SICK! 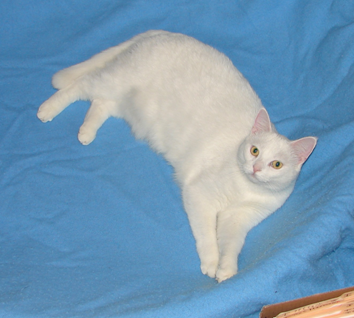 Pixel, my white cat, snuck out of the house the night before last while I was taking stuff out to the shed. The neighbors saw her in the woods near our house but search has found nothing. I’ve attached a picture. If anyone hears of anthing PLEASE let me know. approximately 1 year old. Came up missing the evening of 5-4-07.